Floaters appear like tan or dark spots, specks, lines, or webs in your vision. They originate from tiny clumps of the gel that fills your eye, called the vitreous. Floaters appear more prominent when looking at a plain background, and may come in and out of your vision with certain eye movements. Though floaters may appear to in front of your eye, they are actually floating inside the vitreous gel of the eye. Some people notice floaters from an early age but most people have an onset of floaters later in life. This happens often times due to a posterior vitreous detachment. This is most often a natural process in which the vitreous of the eye degrades and liquefies over time, causing the gel to pull away from the back portion of the eye (the retina). This is a natural process and the floaters tend to become less bothersome over time. Some things can precipitate floaters, such as recent eye surgery, eye trauma, inflammation inside the eyes, or being especially near-sighted. Flashes appear like lightning strikes or camera flashes in your vision. 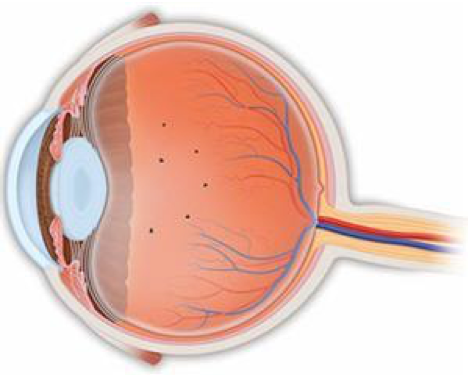 Flashes can occur when the retina is being irritated as the vitreous gel pulls away. Some people have flashes of light in one or both eyes that usually lasts 10-30 minutes but no more than an hour. These episodes can be indicative of a type of migraine. If it occurs without any headache, that is an ophthalmic migraine. If you get a headache after the visual episode, this is a migraine headache. When should I worry about floaters or flashes? Again, most floaters are benign and do not cause problems. However, if you have the new onset of floaters, you should see an ophthalmologist to further evaluate for any retinal problems. A shower of new floaters, a lot of flashes, or a curtain or shadow coming down in your vision could indicate a retinal tear or detachment. You should see your ophthalmologist urgently for these symptoms.